Jolie DeMarco, Crystal Healer, Clairvoyant, Medium. Free Readings. 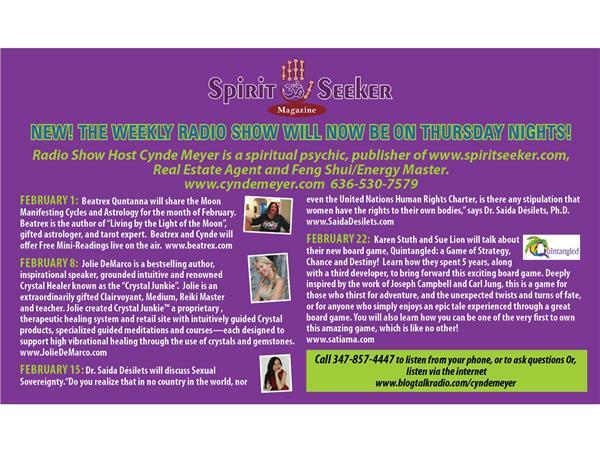 Radio Show Host Cynde Meyer is the CEO, founder and publisher of Spirit Seeker Magazine, a monthly resource for the Mind, Body and Spirit. Cynde works as a certified Life Coach, Real Estate agent, Feng Shui Consultant, and is a nationally known spiritual psychic. Her sessions are by phone and skype. In person sessions in St. Louis, MO. She is known for helping clients totally shift by living with Intention. Her clients call her sessions Spiritual Tuneups!